Are you entering your code in the correct place? The Promotion Code box is for PROMOTION codes only - e.g. "XMAS20%OFF"
My gift voucher expires this month. 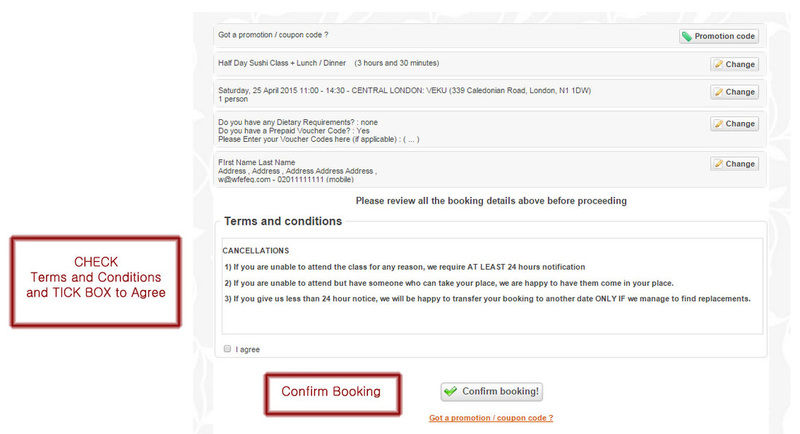 Does this mean I have to make a booking, or actually take the class before the expiry date? You need to REDEEM your voucher by sending us the Voucher Code before it expires. The actual class date can be for ANY scheduled date - even for a date after your voucher expires. Eg. if your voucher expires on 31 April, you can choose to have your class in May, or later, as long as you ACTIVATE your voucher first by making the booking online and send us the voucher codes before the 31 April. "PLEASE COPY ALL PRE-PAID VOUCHER CODES BELOW"
1) BEFORE your voucher expires, please book online, you can choose ANY date that is available. 2) ENTER the correct voucher code/s that is asked for by the booking form. 3) AN EMAIL CONFIRMATION of your booking will arrive immediately - you should get one straight away. If not please check your spam folder. If its not in your spam folder either, it could be that you entered your email address incorrectly when booking. If so please contact us and we can correct your email address for you. We run roughly 5 sushi classes and 30 dim sum classes per month. We add new dates each month. We add classes roughly 2-3 months ahead. If the month you want to do a class is not up yet, please check back later. HAVE YOU ENTERED DIETARY REQUIREMENTS FOR EVERYONE? Eg if your booking is for 2 and both are vegetarian, please remember to state "both Vegetarians"
If just 1 is vegetarian, please make it clear eg "1 veg, 1 usual menu"
Specifically for Dim Sum Class, we can cater for No Pork, No Shellfish. For other requirements please enter it into the box when booking, and if there are any problems we will get in touch with you. For Char Sui Bun class, we cannot cater for Dietary Requirements as we are making a specific thing so there cannot be any deviation. 3) If you are unable to attend but have someone who can take your place, we are happy to have them come in your place. There is no need to inform us. 5) Please note, if you book a class and do not show, your place will be considered used. 6) Please allow enough time for travel. Classes start at the START time, so please ensure you are there on time. If you miss your class due to any reason, your places are considered USED and cannot be rebooked for another date. Younger children can also be accommodated but please do ask us if you are unsure. If you need to change your booking you need to give us at least 7 days notice. TO CHANGE IT YOURSELF: You can change it yourself by clicking the VIEW / CHANGE BOOKING button at the bottom of your email confirmation. LESS THAN 7 DAYS NOTICE? You will not be able to change your own booking date with less than 7 days notice. ASK A FRIEND: If you are not able to attend your class, you can send others to take your place. They only need to know the name it is booked under. There is no need to pay the rebooking fee. Click the BOOK button next to the class you want. A list will show the class dates, and the number of spaces available. If a class only has 1 space left, then there is actually physically only 1 space left. Please do not ask if it may be possible to squeeze an extra person in. ARE YOU SENDING US THE RIGHT VOUCHER CODE? Lots of people send us a random code from a random part of their voucher. To avoid wasting your time, please make sure you enter the code that is asked for. We are constantly having to chase up people who have sent the wrong code to send us the one the booking form actually asks for. 1) If you are unable to attend for any reason, we require AT LEAST 7 DAYS notification. 4) Please note, if you book a class and do not show, your place will be considered used. 5) If you give us less that 7 days notice, we can transfer your booking to a new date, but this is subject to a £25 per person rebooking fee for each person on the booking. 6) Please allow enough time for travel. Classes start as close as possible to the START time, so please ensure you are there on time. If you miss your class due to any reason, your places are considered USED and cannot be rebooked for another date unless the rebooking fee of £25 per person is paid first. If you are having any other booking issues, or have questions, the best way is to contact us via our CONTACT FORM detailing your problem or queries, and we will contact you as soon as possible.